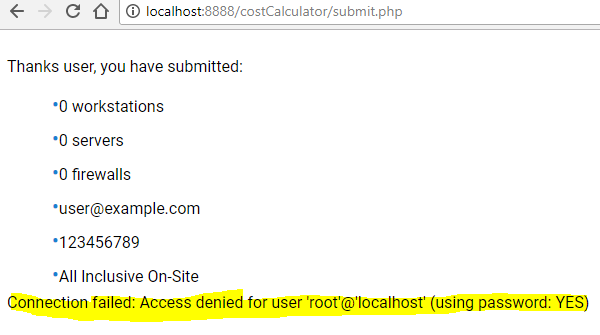 I have a HTML form and I'm using PHP to send the results to an sql database on phpMyAdmin but after submitting I get "Access denied for user 'root'@'localhost' (using password: YES)" error. This is all hosted locally using MAMP, [email protected] is the only user and I'm sure I've got the right password. I've looked through similar questions, flushed privileges, created new users, tried logging on through the command line (to which I get the same error) but nothing seems to work. Try this code possibly it is because MySql expects Mamp to use port 3306. If any issue let me know I will try fixing it.